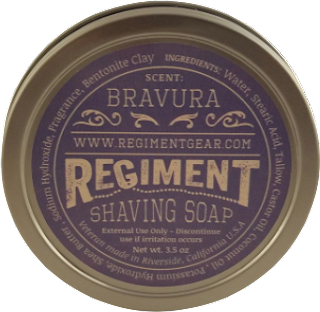 Today I’m looking at the Regiment company’s line of shaving soaps. A veteran owned company with a love of God, Country and the pride of the military service as part of its mission statement. The regiment is a full-service online store. You’ll also find shaving brushes, Safety Razors & Blades, Brush Stands, and other Apparel. 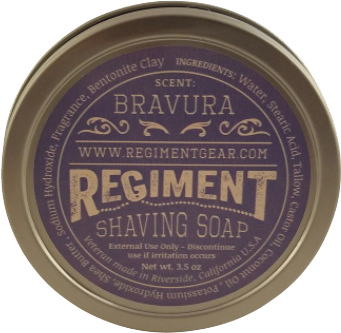 Regiment shaving soap comes in a tin with a screw on lid. The ingredients list runs around the outer rim of the label. Also, visible is the website URL and underneath in bold letters the company name. The scent name is above all this near the top. Tins are becoming rarer these days since plastic tubs are resistant to dings and dents and can be such a pain to deal with. I’m not sure exactly why but I can’t see this product in any other vessel other than a tin. It’s just the way I see it. Place this in a plastic tub and it loses its authenticity somehow. The scent of Bravura is according to the website Inspired by the vision and sound of bravery this scent is bold, fresh, and clean with a touch of spice and orange zest. I get the Orange as almost a middle note with the spice coming in with a hint of a peppering ending. Ingredients: Water, Stearic Acid, Tallow, Castor Oil, Coconut Oil, Potassium Hydroxide, Shea Butter, Sodium Hydroxide, Fragrance oil, Bentonite Clay. This is a tallow based soap with outstanding slickness and glide. A perfect soap for any wet shaver even more so if you use a straight razor. Creating a bowl lather was no problem. When placing the soap inside the bowl an explosion of fragrance started to happen and in just a min I had a rich creamy lather which got right into my 5-day old bread growth with ease. I used my R89-Grande with persona blue blade and what a pleasure it was the superior slickness and glide allowed me to go over my trouble areas without the irritation of any kind. The post shave feel was great which was topped off with American Blend after shave from Fine. So, I had an excellent shave with Regiment and I know you will too. They offer nine different shaving soaps scents allowing you to be able to find something you’ll like. It would be nice if they offered a way to create a sample pack of your own when on the website but regardless of that I was extremely happy with Bravura and would recommend that as a starting point.